We begin today with a look at what could be the next cultural battle to rage around Ben Carson, namely his views on intelligent design versus evolution. Lost in the media hissy-fit over Carson’s recent comments on Muslims and the presidency and his belief in aggressive self-defense after the Oregon shootings has been his adherence to a strict interpretation of the Bible, which includes believing in a God-created world. 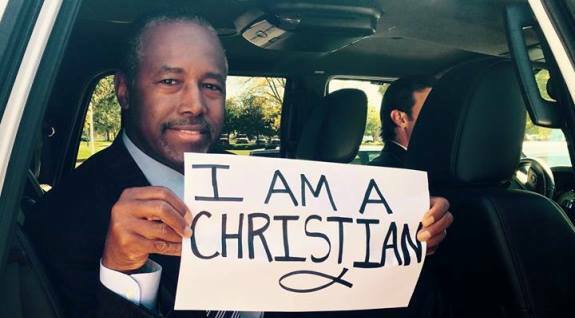 Of course with Carson, it goes much deeper than just his religious beliefs. He thinks intelligent design is a sound theory based on his observations as a neurosurgeon and has a plethora of scientific arguments to back it up. Nevertheless, Professor (of Mathematics) Granville Sewell predicts in the American Spectator that Ben’s unflinching defense of his beliefs will only be treated with scorn because they go against the notion of accepted science. There are many in conservative circles who’ve argued in favor of intelligent design over the years and it’s not just because of a serious suspicion of the motives of the scientific community. It’s because deep thinkers always see alternatives and there is absolutely no way to prove Darwin’s Theory of Evolution is indisputably correct – or incorrect, for that matter. But the liberal mindset preaches that anything contradicting what a fifth grade science teacher might have taught them thirty years ago could only stem from the rantings of a kook. With these people, alternative views are seen as a threat to the status quo. Liberals hide behind “science” to further their agenda. To concede there could be such a thing as intelligent design is a tacit admission that there is a God and he has a plan. To admit there’s an intelligent God would infringe on other liberal sacred cows, the most obvious being abortion. In other words, get ready for the onslaught of questions to Carson regarding this topic. If the recent past is a guide, the “outrage” will be intense. And it will probably only make Carson’s poll numbers rise further. Jeb Bush’s poll numbers remain in the dumps (at least for the anointed establishment frontrunner in the race) and there are no signs the “outsiders” will fade anytime soon. Even members of the establishment are starting to see that Donald Trump and Ben Carson are in it for the long haul and there certainly must be some panic at RNC headquarters and on K Street. It’s looking pretty bad for them, so what would happen if Jeb backed out? Erick Erickson of Erickontheradio.com writes that at least initially, a lot of people likely supported Trump because they were determined to prevent another “coronation” primary cycle that first led to John McCain and then Mitt Romney winning the presidential nominations in ’08 and ’12. But if Bush were to remove himself, Erickson argues it would free up Trump Republicans to at least look at the other candidates. It’s an interesting theory, though I don’t see Jeb getting out of the race this early (can you imagine the blow to the Bush family legacy if Jeb quit before the early voting states?) and even if he did, I don’t see Trump’s numbers changing all that much as a result. I’ll say it again – people who like The Donald like him and those that don’t, don’t. In 2012 there was Romney and a succession of “not Mitt” candidates auditioning to be the leader of the anti-establishment faction. Romney ultimately emerged as a damaged establishment candidate, conservatives got on board anyway and gave it their best effort to elect him -- and the rest is history. Lastly on Jeb, he claims that as president, he would end crony capitalism. I know, I laughed too. Geraghty chronicles a couple instances where Jeb’s post governorship work collided with corporate favoritism. Is Jeb on the level when he says he’d work against corporate welfare? Probably in some form. If he’s the shady politician-type, he does a good job of hiding it. But his family’s extensive connections in both the political and corporate worlds just cries out “investigate me” for anyone looking for crooked dealings. Jeb’s just trying to say he’s an “outsider.” No one believes him. Many people thought Carly Fiorina’s best moment in the CNN Republican debate was when she shot back at Donald Trump over his “look at that face!” comment he’d made about her during an interview. But I would argue all of Carly’s best moments revolve around her relentless pursuit of Hillary Clinton – especially when Fiorina’s calling the Former First Lady a liar. It’s a charge that draws attention and distinction at the same time. It’s an effective ad because it shows Fiorina at her best and Clinton at her worst – a means of exposing voters to two distinctly different styles. Who constitutes her base of support, for example? For Mike Huckabee, it would be Christian social conservatives. The establishment business class would favor Jeb Bush or maybe Marco Rubio. Tea Party conservatives have their choice between Donald Trump, Ted Cruz and Ben Carson. Defense hawks have… well, most of them. Where does Fiorina fit? She might draw from each of those groups, but you get the sense she’s still searching for a niche. The media would of course point to the fact she’s the Republicans’ only female candidate, but there’s no evidence that conservative voters would favor Fiorina just because of it. Until that time, Fiorina will likely just go up in the polls after each debate only to sink slowly after. Finally today, Donald Trump leads another new national poll, but Ben Carson is definitely closing the gap. The two-thirds support threshold for “outsiders” is confirmed in this poll as well, with Trump, Carson, Cruz and Fiorina totaling 63% between them. There’s more good news for Carson. “When asked which candidate would be their second choice, GOP respondents tended to choose Carson, followed by Trump and Rubio. That tally means that, when GOP primary voters' first and second choices are combined, the former neurosurgeon manages to best Trump, 44 percent to Trump's 39 percent,” Dann writes. The only thing that’s remarkable about this poll is its consistency with other recent surveys. For candidates who claim “the polls are wrong,” all of these results that basically say the same thing must be disheartening. The picture is getting clearer – and it’s looking more and more like Trump and Carson are going to head into November with a solid lead for the Republican nomination.